This item does not qualify for any discounts or free shipping! Analogue Productions Ultra Tape *Condensed video featuring tape duplication at Blue Heaven Studios! Custom slipcase cover - highest quality tape reissue!From Acoustic Sounds, Inc., the world leader in audiophile music sales, comes the highest quality analog reel-to-reel tape album reissues - Analogue Productions Ultra Tape! "It certainly wouldn't be going out on a limb to say that Scheherazade and The Pines of Rome were two of the most anticipated Analogue Productions Ultra Tape! Series releases. High expectations sometimes lead to disappointment, but not here! Both reel-to-reel tape releases live up to and exceeded expectations, especially in terms of recreating the original recordings dynamics, spatiality, and resolution." — Myles B. Astor, Positive Feedback magazine, Issue 93, Sept. 1, 2017. Read the entire review. Twelve masterpiece titles are featured in this new reissue series, each a 15 ips, ¼-inch analog tape copy (IEC equalization) sourced from a copy of the original analog master tape. Transferred real-time, using an ATR-modified Ampex Tape Machine with flux magnetic heads. Custom slipcase cover. The first two titles — Janis Ian's Breaking Silence and Ben Webster's Gentle Ben are releasing before 2016 ends. The jewel in the Living Stereo crown. Enchantment awaits within! 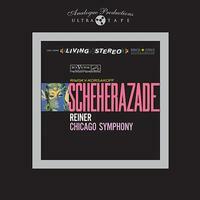 Fritz Reiner and the Chicago Symphony convey the listener on a magic carpet of Living Stereo sound to mythic Arabia and China, guided by two of Russia's greatest orchestral masters. This, like the Respighi, is considered one of the very best recordngs by Reiner, the Chicago Symphony Orchestra and RCA's crew. An album of supple and sensuous performances, the sound alternately shimmers and stuns with the clarity of its definition and intensity of its climaxes. Each Ultra Tape reissue copy is priced at $450. The remaining titles include: Rickie Lee Jones' It's Like This / Rachmaninoff's Symphonic Dances (the famous Turnabout recording) / Hugh Masekela's Hope / Fritz Reiner and the Chicago Symphony Orchestra's Pines of Rome and Fountains of Rome (RCA Living Stereo) / Leopold Stokowski's Rhapsodies (RCA Living Stereo) / René Leibowitz and the Royal Philharmonic Orchestra The Power of The Orchestra (RCA Living Stereo) / Fritz Reiner and the Chicago Symphony Orchestra's Lieutenant Kije and Stravinksy's Song of the Nightingale (RCA Living Stereo) / Abel /Steinberg — Beethoven Violin Sonata (Wilson Audio) / and Lowell Graham's Winds of War & Peace (Wilson Audio). See all of the Ultra Tape reel-to-reel editions here. Customer Reviews (5.00 Stars) 3 person(s) rated this product. What to say. I have this on both the 180 gr., 200 gr., and the 4 x 45RPM one sided editions from Classic Records. And still I`m sitting here with the feeling of hearing this for the first time. The space, fundament, realism, the feeling of no limits is what`s making me speechless. The hair rising and the tear im my eye tells everything. Thanks! These tapes are what musical dreams are made of. Stunning sound quality of this fantastic performance. Keep them coming Chad !!! This is the fifth tape of the series I received. I also have the complete first subscription of the Tape Project tapes, and more than 20 concerts I have recorded live of the Hong Kong Philharmonic and chamber concerts from the era of Edo de Waart. I thought nothing could compare to the session masters of live concerts, but I was wrong. This 54 year old recording really taught me what a concert recording should sound like. Of course, I would love to have the M49, M251, C12 and other classic mikes they had at their disposal. This tape has a realistic sound stage, and no hint of dynamic compression. It gives a sense of unlimited dynamic expansion in the last movement, something I have only encountered with true master tapes. The sound is absolutely natural, nothing hi fi about it. Just make sure your system can handle it. The only realistic way to fully reproduce this is to use compression drivers with horns.